Finding full-sized fake bushes is an easy proposition because many retailers carry them. Finding fake bushes on a smaller scale can prove to be quite complicated, especially if you want the bushes to look realistic. The task can become even more difficult if you want the fake bushes to be durable. Whether you want miniature bushes for a diorama or something a little larger for a table decoration, the process is similar if you make them yourself. Harvest some nice full empty branches near the end of a large tree limb or sections of new growth from a large and very mature bush. Select only branches smaller than the circumference of your little finger for tabletop decoration and branches smaller than the circumference of a pencil for diorama-sized miniatures. Select one branch the appropriate size per bush to be your trunk. Trim many smaller branches to graft on to the larger branch. Use branches with five or more smaller branches growing out of the end and an inch or more of bare space to incorporate it into the larger branch. Wrap floral wire around one of the larger branches on your trunk and then wrap the wire around a smaller branch and on the base of the larger branch to create more bush space. Repeat the process until you have lots of branches extending off your trunk. Trim the branches so you have a bushy looking assembly of branches with lots of little twigs to populate. Use floral tape to wrap the combined branches, hiding the wire and making your branches look smoother. Cut the base of the trunk off flat and sand it smooth. 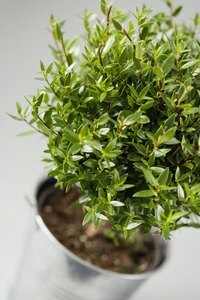 Glue the base into a bottle cap for a miniature bush or into a clean tuna can for a tabletop decoration. Fill the interior of the cap or can with melted paraffin. Pour fine sand on top of the paraffin and let it cool, trapping the sand in the wax. Spray adhesive over the sanded wax and pour more sand on top of the base. Shake off any excess. Repeat the process if you can see any of the paraffin. Cut leaves of various sizes out of green paper or a solid green fabric. Alternatively, for short-term use, pick small leaves off a bush or sprouting tree. Begin with the larger leaves and hot glue each leaf on a branch, filling in from the bottom of the bush toward the top and from the interior out to the smaller twigs. Fill in the spaces with smaller leaves, making sure you add small leaves to the ends of every twig. Glue smaller leaves around the exterior shape of the bush and along the top. Draw tiny flowers onto colorful tissue paper if you want your bush to bloom. Cut out the flowers and glue them along the exterior shape of the bush. Mist the bush with fragrant essential oil such as lavender, rose, lemon balm or orange if you want your viewers to believe they can smell the blossoms.